A hidden history connects India and the United States, the world’s two largest democracies. From the late nineteenth century through the 1960s, activists worked across borders of race and nation to push both countries toward achieving their democratic principles. At the heart of this shared struggle, African Americans and Indians forged bonds ranging from statements of sympathy to coordinated acts of solidarity. 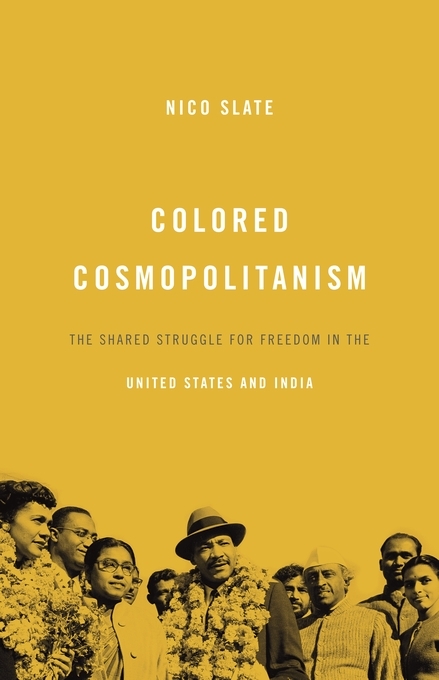 Within these two groups, certain activists developed a colored cosmopolitanism, a vision of the world that transcended traditional racial distinctions. These men and women agitated for the freedom of the “colored world,” even while challenging the meanings of both color and freedom. Colored Cosmopolitanism is the first detailed examination of both ends of this transnational encounter. Nico Slate tells the stories of neglected historical figures, like the “Eurasian” scholar Cedric Dover, and offers a stunning glimpse of people we thought we knew. Prominent figures such as Mahatma Gandhi, Jawaharlal Nehru, Swami Vivekananda, Booker T. Washington, W.E.B. Du Bois, and Martin Luther King, Jr. emerge as never before seen. Slate reveals the full gamut of this exchange—from selective appropriations, to blatant misunderstandings, to a profound empathy—as African Americans and South Asians sought a united front against racism, imperialism, and other forms of oppression.